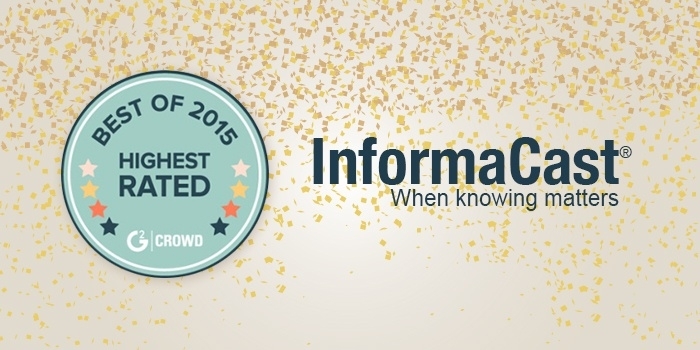 We're so excited to announce that our InformaCast software received two spots on G2Crowd's Best of 2015 User's Choice Lists. InformaCast was recognized in the categories of Shortest Time to Return on Investment (ROI) for enterprise users and Highest Rated Satisfaction from enterprise users. We don't -- as Lady Gaga would say -- live for the applause (applause, applause...), but it does mean a lot to us to know that you're getting real value from InformaCast. Our clients are at the heart of everything we do, and we don't take it lightly that many of you use our software to help keep your people safe when emergencies strike. We also know that much of the credit goes to you. Several InformaCast features were created from feedback we received from talking with clients at users group meetings, trade shows, and via our website. You are the ones who have come up with some of the most original uses for our software. Some of you have even saved a pretty hefty chunk of change along the way. As we plunge head-first into 2016, we want to continue to provide you with solutions that make your workplaces safer, your lives easier, and your businesses more efficient. If you have an idea, suggestion, question, or just want to learn more about what we do, please don't hesitate to connect with us via our website, Twitter, or email.